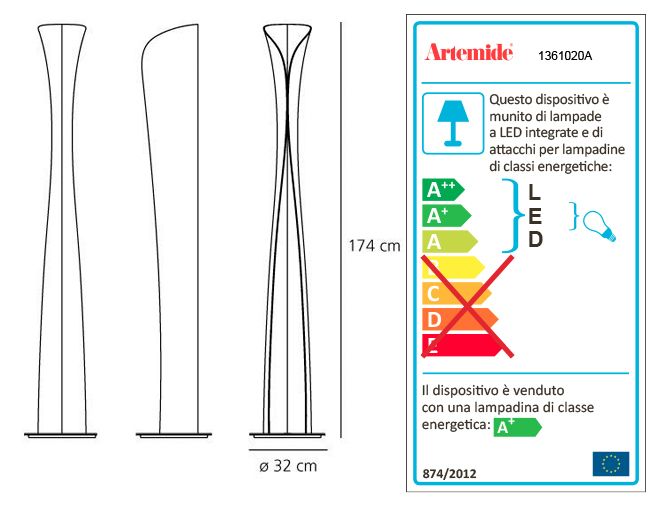 Cadmo Artemide is a floor lamp design by Karim Rashid. A steel panel screens and releases a soft indirect light upwards together with a diffused light along the vertical aperture of the lamp. Combination of halogen light sources, for indirect and diffused emission, with separate switching. Painted steel body lamp, with cover-base in painted inox-steel. With light intensity regulator. Integrated LED not replaceable, indirect: 3000K, 44W, 4003lm, CRI=90 + direct: 10W LED (GU10), 3000K. Dimmer / diffused not dimmable.